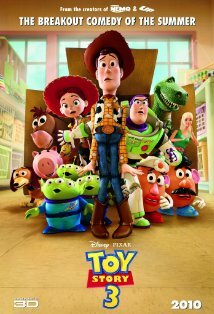 In anticipation of the release of Toy Story 3 on Tuesday, November 2nd. There’s lots of deals out there at the stores. To help you reduce the cost even more don’t forget about the Toy Story 3 – $8 off printable coupon that’s available, as well as two $5 rebates from Campbell’s Kitchen and Rayovac! Toys are Us has a lot of deals going on right now when you purchase Toy Story 3. Get a FREE $10.00 Gift Card with any Disney Movies purchase of $40.00 or more. On the last page of their Great Big Christmas Book look for a FREE $10.00 Gift Card with a qualifying purchase of $75.00 or more. I got the Toy R Us Great Big Christmas Book in the Sunday Edition of the Detroit Free Press. Get a FREE Toy Story Limited-Edition Clock ($14.99 Value) when you buy Toy Story 3 on DVD or Blu-ray. Get a FREE Toy Story 3 Popcorn Tin (9.99 value) with ANY Toy Story purchase of $30 or more! Sign up for the Toys R Us Rewards R Us program and you will earn 10% back on your Holiday Purchases. Toys R Us: DVD-only copy for $19.99, or the combo pack for $26.99 after coupon. **Look for the in-store coupon book for an additional $3.00 savings and don’t forget to mail in your rebates. If you purchase two of these videos (One for You and One for a Gift) you will qualify for the FREE $10.00 Gift Card (Disney Movie Offer). And, if you spend $75.00 you will qualify for the FREE $10.00 Gift Card for a $75.00 or more purchase. CVS: Toy Story 3 DVD Promotion – Save $16.00 on Toy Story 3 DVD when you buy $25.00 worth of Proctor & Gamble Products (Limit 1). $25.46 for Detergent, Toothpaste and DVD! Walmart: Buy the DVD-only copy for $15.98, or the combo pack for $16.98 after coupon. For additional Toy Story 3 Deals check out “Cents” able Momma.